The ultimate way to welcome a new baby or show your support for new parents, a gift basket makes a fun and functional present. Ranging from themed designs to gourmet specialty selections, there are dozens of baby gift basket options to choose from. You can purchase baskets at local stores, select one of the many wonderful choices available on the Internet, or make your own gift basket at home. One of the cutest options for gift baskets involves centering the entire gift around a theme. This can be bath time, bedtime, a certain animal, or the color of the nursery. Several companies specialize in this type of basket. If you are interested in a more personalized gift, many websites will personalize your gift basket by adding the new baby's name to various items in the basket. This is a great welcome gift to send to parents after the baby has come home from the hospital. The Baby Gift Basket Co. 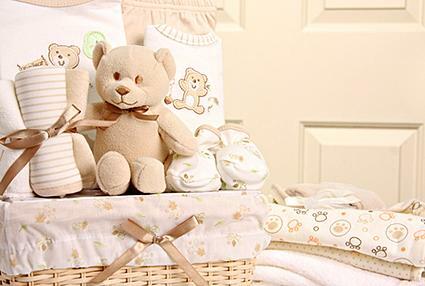 If you're hosting or attending a baby shower for the new mom, a gift basket can make the ideal shower present. Often, these take on the form of familiar baby shower motifs, like storks and baby buggies. You can also use many baskets as centerpieces during the festivities and then have the mom-to-be take them home after the party is finished. Several sites offer great options for this type of gift. Several gourmet gift basket sites offer selections especially for new parents. Since those first weeks home with a baby can be hectic, a gift basket like this can be a big help. The New Parents Golden Gift Basket from Gift Tree includes popcorn, snacks, sweets, and tasty treats for the new mom and dad. The Welcome Baby Girl Cookie Bouquet from Cherry Moon Farms comes in various sizes and includes tasty cookies for Mom and Dad to snack on during those midnight feedings. They also have bouquets for baby boys. The Burt's Bees Baby Bee Box gift basket is the perfect gift to send during the baby's first weeks at home. It features adorable clothing and Burt's Bees bath products. Simply Unique Gift Baskets has a line of gift baskets for the older sibling of a new baby, featuring toys and activities to keep the big kids busy while Mom and Dad care for the new baby. 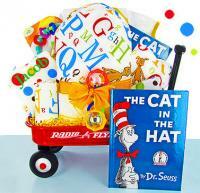 If you have the time, it can be fun to assemble your own gift basket for the new baby. Try one of these fun ideas. No matter if you buy or build your gift basket, this present will be the hit of the party! The new mom, dad, and baby can enjoy all of the wonderful items inside, and you can feel satisfied with the fact that you've selected the perfect present!